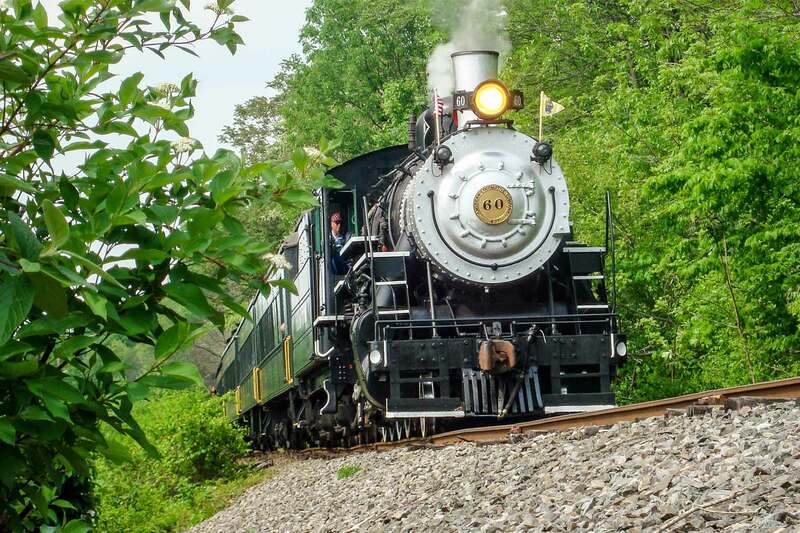 Ride an Exceptionally Scenic Railroad and Visit Beautiful New Hope, Pa.
For our second day trip of 2016, the ERA we will visit the historic Black River and Western Railroad in Flemington, New Jersey and have lunch and sightsee in New Hope, Pennsylvania. The Black River and Western Railroad is a short-line railroad that was founded by a group of railfans in 1965. Today, it runs 16 miles through Three Bridges in the north, to its southern terminus along the nearby Delaware River. This scenic railroad has collected a wide variety of authentic coaches, vintage diesels and steam equipment, and features a fully restored 1854 train station. This is an excellent way to experience old-fashioned railroading in action. Following that, we will have ample time for a lunch break in New Hope, Pennsylvania’s beautiful downtown, where a variety of restaurants and food choices will be available. We’ll be sure to let everyone visit New Hope Station, now serving as the ticketing office for the New Hope and Ivyland Railroad. Our chartered Coach Tours bus will leave promptly at 8:30 AM from the east side of 8th Avenue, just south of West 41st Street, across the street from the Port Authority Bus Terminal. It is expected that the bus will return before 7 PM, so there will be no dinner stop. The ticket price for the chartered bus, train ride and museum visit is $69. Lunch is not included in this price, but time has been allocated for you to purchase lunch in New Hope. We are limited by bus capacity to 40 participants, so please book your tickets ASAP! For further information, please contact Robert Colorafi. Click here for a print version of the order form.